If you have any questions or suggestions you are welcome to join our forum discussion about Missing Entries, Entering Trades Late. There will be many occasions when a trader will either hesitate to enter the market at a certain time or will just sit at his computer and join the market well after a strong trend has formed, thus, missing out a large part of its duration. At this point, he will wonder whether he should just wait for a trend reversal that can be captured or enter the market, although the current trend might be close to its exhaustion point. Well, the answer is simple. If you think that had you taken the initial entry, you would still be holding a portion of your trade after you have scaled out of the trade, combined with a certain protective stop, then what you need to do is to enter the market with exactly that portion and stop loss. Of course, such a decision should be based on sound analysis, not only on eagerness to hop on because the market is trending. Day traders who use small time frames such as 5 minutes enter swing trades commonly. These are positions that last longer than a scalp and persist through at least one pullback. Such a trade involves the use of the scaling out technique. At least a part of the trade is held without a profit target, due to expectations for a strong prolonged market movement, aiming at a risk-to-reward ratio of a minimum 1:1. After that is achieved, the trader locks in some of his profit, thus scaling out of the trade, and remains with a certain portion of his trade on the market. This is the exact point where the discussed late entry comes. It should be of the same size and with the same protective stop as the remaining portion after the scale out. For example, let us imagine that you had bought 1 standard lot of EUR/USD at 1.3000 with a trailing stop 20 pips away, after which the market jumped to 1.3020, where you sell 7 mini lots, thus, completing your scalp. You are now left with 3 mini lots at the current price of 1.3020 and select a wider stop-loss, for example, at 1.2990, which you will use to milk the uptrend for additional profit. 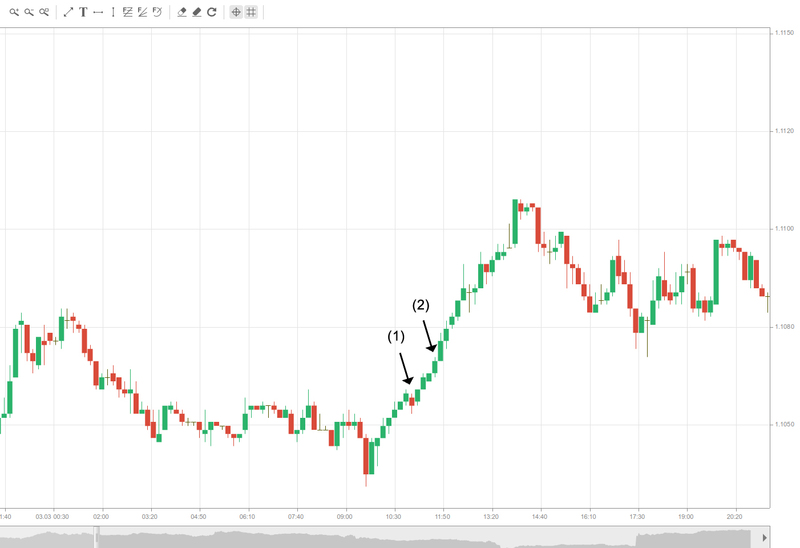 Had you not entered the market at 1.3000 and instead want to join now, then you should buy 3 mini lots of EUR/USD at 1.3020 while placing a stop loss at 1.2990. Emotionally, some traders will find a difference between these two situations. Some will think that entering at 1.3000 and aiming for an open profit carries less risk for them, because every pip they win is someone else’s money, thus, the risk is smaller. This is not true, because as the market jumps to 1.3005 and you’ve profited 5 pips, this is now your money, if you lock it in. Therefore, it is no different than entering at 1.3200 with the same protective stop that you would have used otherwise. An experienced trader knows that and will not hesitate to enter these trades, because the probability of making a profit is high. This is especially true when the market has formed three, four or more consecutive trend bars, which however do not show climactic behavior (are not too big), suggesting that a strong and possibly prolonged trend is in motion. When a trader sees such a scenario, he should enter the market with at least a small with-trend position, instead of waiting for pullbacks. On the screenshot above you can see a suitable example. The market formed a bullish two-bar reversal and entered a very strong bullish trend, consisting of small but many successive bullish trend bars that don’t show any climactic behavior. Let us assume that you would usually enter a long position above the high of bar (1) and place a protective stop beneath its low. If for some reason you have missed that entry point and began observing the market at, say bar (2), then you would think that you would wish you had at least the swing portion of that original order in the market. In that case, you can safely go long above bar (2) with that portion and use the same stop as you would have below bar 3. You can also use a breakeven stop. If the market continues to rise in your favor, you can add to your position, but that must always be accompanied by moving the stop of the entire position up, according to the addition.